Swollen ankles after flying how long does it last? We get asked a lot of questions about swollen ankles after a flight. People want to know why their ankles swell after flying, how long the swelling will last and if they should get worried. In truth, this is one of the most difficult questions to answer because swollen ankles after a flight can be caused by many things. Knowing what exactly to do depends on the specific cause of swelling. Edema, the medical term for swollen ankles and legs, occurs when you sit in one position for a long period of time. 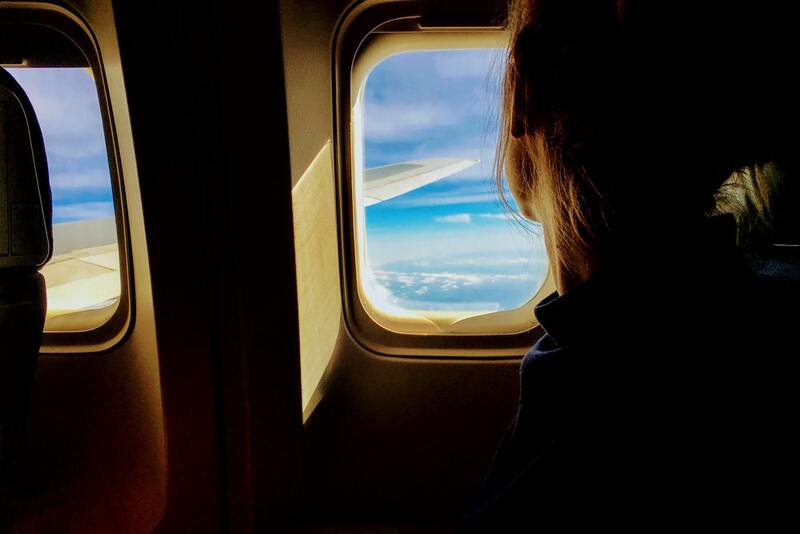 In a flight, you are more likely to sit still for prolonged periods than you would at home or at the office. Even if you are in perfect health, all the liquids in your body (i.e. blood) sinks into your lower extremities, causing your ankles and legs to swell a little, or a lot. It’s not a serious condition. In fact, it’s a typically harmless phenomenon, but it can make walking uncomfortable until the swelling dissipates. It can also make your shoes feel extra-snug. You may even feel a little self-conscious about the size of your legs when you arrive at the airport. Don’t sweat it! The swelling should only last for a short while and get better after you walk out the plane. Unless there’s excess swelling or excruciating discomfort and pain, which can indicate a more serious condition such as a blood clot. In such a case, you should seek immediate medical attention. Take a rest and elevate your legs: Find a place to sit with your feet elevated as soon as you alight (using a foot hammock, for instance). Seating areas in the airport will be the closest and most convenient, and you can sit with your feet up on adjacent seats in less crowded areas. Exercise: After taking a brief rest with your shoelaces loosened, start doing gentle exercises. Massage your ankle. Move your legs around. Finally, press your feet onto the floor and swing them around while seated. Soak your feet: When you arrive at your final destination, soak your feet in a basin of lukewarm water for at least 15 minutes. Continue doing gentle massages and exercises and rest with your feet elevated until the swelling dissipates. Wear clothing that fits loosely. Also remember to wear comfortable shoes for swollen feet. Do not wear tight socks that can restrict free flow of blood in your legs. Drink lots of water before the flight. Avoid alcoholic drinks and drugs that might reduce your ability to safely move around the plane for stretching breaks. Take baby aspirin just before getting on the plane. Check with your primary physician to ascertain that you’re not at risk for bleeding and that the small aspirin pill won’t interact with your other medications. Put your luggage in the overhead bin area so that there is nothing blocking you from moving and stretching your legs freely. Keep rotating your ankles and massaging your feet during the flight. Flex and release your leg and thing muscles occasionally to boost blood circulation in your lower extremities. Sip water as many times as you can. Stay away from alcohol, caffeine and salty snacks that may intensify the swelling in your legs and ankles- during the flight. Walk up and down the aisle while gently stretching your legs after every hour or so especially if you’re on a long flight. If you recently had surgery, are pregnant, or have a condition that makes you more prone to ankle swelling, you may want to wear flight compression socks whenever you fly. These socks press lightly onto your skin and aid in proper blood circulation. They can be difficult to wear, so do some practice before your next flight. It’s best to put them on at home before heading to the airport. Alternatively, you can pack them in your bag and wear them just before you board your flight. If compression socks don’t work, your doctor may recommend blood-thinning meds before your flights. Here is a YouTube Video to help you better understand why your ankles swell after a flight and what you should do to help yourself.